Public and academic libraries alike are facing a variety of challenges surrounding information, facts, and trust. These challenges arise from a societal shift that has been building over the half century since Richard Hofstadter published Anti-Intellectualism in American Life in 1964. Though scholars may disagree on the actual level of anti-intellectualism in the United States, there seems to be little doubt that many of our library users increasingly encounter opinion presented as fact, disturbing dismissals of science, and a lack of critical thinking on social media and in the news. Unfortunately, this disturbing trend also seems to be making an appearance in information available from formerly reliable sources. 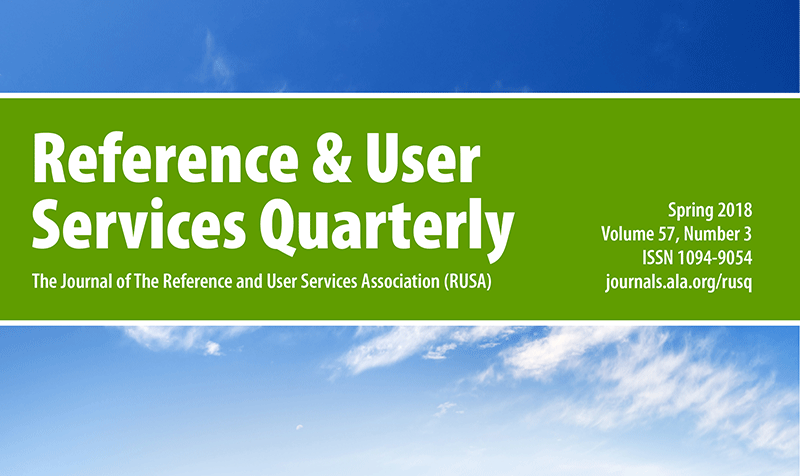 As this issue’s editors, David A. Tyckoson and Nicolette Sosulski, noted in their proposal for a special issue of RUSQ on information trustworthiness, “Professional organizations, educational institutions, [and] government agencies have always been trustworthy providers of quality information. But now that we are living in a time when government speech is inhibited, and some agencies are removing or revising their own publications, where do we find accurate and authentic information?” The columns and articles in this special issue of RUSQ have all been selected by Dave and Nicolette or by the RUSQ column editors to reflect in some fashion on the topics of information, authority, and trust, especially in regard to government information. Librarians as information professionals have always sought to provide access to accurate and authoritative information. Now, we need to be at the forefront of ensuring not only that access is preserved, but also that information itself does not become lost in the culture wars. To access the full issue, please visit the journal website.